Marcham Society has an extensive archive of local photographs (old and new), family records, parish records, press cuttings, documents, indentures and wills, maps, a survey of the gravestones in the churchyard and cemetery and surveys of the local wildlife (plantlife, birds etc.). We have a project to catalogue the archive and make the catalogue available online, with simple search capabilities. Meanwhile if you wish to consult the archive please call the Archivist, Elizabeth Whitehouse on 01865 391389 or contact us. Sacred to the memory of WILLm. STONE of Marcham Green, who departed this life April 3rd 1844 aged 48 years and also of ESTHER ELIZth. LYNE STONE only daughter of the late WILLm STONE who departed this life June 23rd 1848 aged 22 years. Also of Henry LEWIS eldest son of the late WILLm. STONE who departed this life March 25th 1851 aged 26 years and of EDWARD WILLm. second sone of the late WILLm. STONE who departed this life Sept 2nd 1853 aged 24 years. Sacred to the memory of MARY widow of the late WILLm. WARE of Latton, Wilts and of the late WILLm. STONE of Marcham Green who departed this life March 5th 1856 aged 63 years. Erected in affectionate remembrance of THOMAS EDWIN second son of the late WILLIAM WARE of Latton, Wilts, who departed this life August 21st 1856 aged 41 years. Even so saith the Spirit for they rest from their labours". Sacred to the memory of WILLIAM JESSE eldest son of the late WILLIAM WARE of Latton, Wilts who departed this life March 28th 1840 aged 28 years. Will proved at Oxford 10th Sept. 1885. A copy was obtained from The Probate Registry. 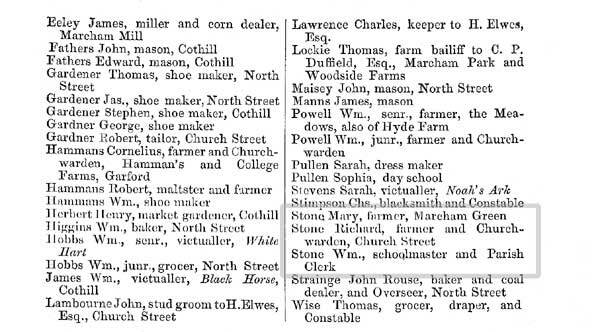 1840 William Stone, Marcham, Freehold house and land, in his own occupation. William Stone, Sen., Marcham, Freehold house and land, Church St. in his own occupation. Richard Stone, Sen., Marcham, Freehold house and land, in his own occupation. Richard Stone, Jun., Marcham, 30 acres of land. 1850 William Stone, Sen., Marcham, Freehold house and land, Church St. occupied by self. Richard Stone, Sen., Marcham, Freehold house and land, occupied by self. Richard Stone, Jun., Marcham, occupier of the house and land, The Buildings Farm. All this information can be used to produce a family tree. 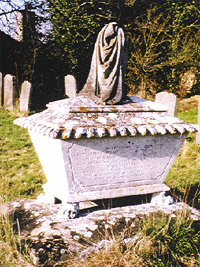 By 1855 Mary Stone was a widow for the second time and four of her children had predeceased her. She died in April a year later, followed by the death of her eldest son, Thomas Ware in August 1856. The only surviving members of this family were Sarah Ware, the widow of William Ware and their daughter Mary. They left Marcham and went to live in Oxford.